Improve the credibility of the post. ‘It’s a marathon, not a sprint’ is a phrase commonly used to describe how a slower and steadier approach will help you to conserve energy, allowing you to complete the whole journey by taking gradual steps forward. The idea behind this is to help you absorb the finer details instead of having to frantically try to cross the finish line, leaving you feeling burnt out and lacking in motivation to take the next step on another journey. But what if you can take the qualities of going the distance while combining this with sudden bursts of changes to amplify organic visibility? By no means does this post replace a long-term strategic approach. Instead, by clearly defining your goals, adopting these techniques cannot only help to edge you closer to those goals at a faster rate, but it can ensure you are being productive on the right things. Despite counter statements indicating that links are either massively devalued compared to a few years ago, or in some cases, perceived as an unnecessary part of the Google machine (this has probably come from those ‘SEO is Dead’ folk); there is such overwhelming evidence to suggest that they are integral in determining the order of search results. In this post, I share how you can test and witness its influence. So based on this evidence, if a site already has an established domain, which covers core-ranking factors, it will mean the changes suggested below will have a better chance at succeeding at a faster rate. If you are already familiar with the link building process, then you will know that nowadays, it takes longer than spinning some content and pushing a button to submit them to unsavoury sites. But if you are less familiar with the concept, acquiring high-quality links takes time! And in fact, even if you were to attempt to fast track the process, this in itself can have a detrimental effect on performance. A little caveat: for sites which have a stronger link profile, applying a few links can make all the difference, allowing you to move the average keyword group positions for a page from 12th to 5th. This is simply an average across sectors and query types (there are strong fluctuations between these and as shown below, there are a few ways that you can influence the CTR), but it helps to give a good indication on the potential CTR that you can receive. By paying particular attention to those related page groups which are either placed in the top 10 or between 11th or 20th, subtle movements while in these positions can help you benefit from a better CTR in the short term. Once deciding which pages to select, extra weight should be given towards those pages which already have links directed to them. To do this, SEMrush & SEO Monitor are both amazing tools to help pinpoint where those golden nuggets lie. Based on their existing presence, current link profile & content relevancy, determine which pages and sections are realistic targets. Assess the influence of pages and sections that provide goal completions. This is important in helping to assign value to a session or unique page view. The number of pages that facilitate a visitor’s user intent. For example, those seeking to know more about what luxury holidays are available across Europe, yet are undecided on a specific location will want to know more information such as weather, things to do, costs and options before they make further decisions. Whether the bounce rate across different devices is more pronounced. This can help identify whether additional user testing is required to establish why this is happening. 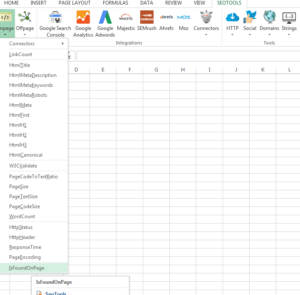 The GA tab I have uses SEOtools For Excel by tapping into the API of Google Analytics. It plots out the range of metrics, including sessions, bounce rate, goal completions, exit rate, unique pageviews, accessibility score, bounce rate & sessions across mobile, desktop & tablet devices. Using the above image, it presents the total available monthly searches per page. Once this is combined with metrics such as, organic traffic, Meta titles, goal completions and the total number of inbound links towards the page, it is possible to accurately establish what is influencing this presence. A correlation can be made, meaning if your work is more aligned with what they are undertaking, you will be more confident that by replicating this activity, it can bear fruit. By tagging the user journey stage against each page (unfortunately this is a manual job), this can help you assess how your site content is distributed. Importantly, this can provide additional insights. For example, whether new pages need creating or more targeted work needs to be applied to help improve positions for those, which are already ranking in more advanced positions. There have been quite a few posts which indicate that simple content refreshes can support the growth of organic search. Folks at Hubspot and in particular, Matthew Barby and Pamela Vaughan have both suggested that you can receive boosts in performance by regularly updating old posts. To do this, consider these couple of points. Following the introduction of RankBrain back in 2015, a form of machine learning which Google uses to process and evaluate information by monitoring search patterns, Metadata refreshes are viewed as one of many important steps to realise the benefits. In his Whiteboard Friday Rank Brain edition, Rand Fishkin provided some insights suggesting that this part of the algorithm is different from the other algorithmic roles. Instead of using it as a technique to directly influence rankings, the benefits can be realised by making it easier for the search engines to interpret and determine the intent of queries. The role of latent semantic indexing (see below for further information) is viewed as an important step in assisting with the interpretation. But interestingly, there has been a range of studies done which reveal the impact meta title changes have on performance. One post, which stands out, was by Larry Kim – although I do not agree with his idea to apply numbers of headings across the majority of blog posts, the evidence is quite compelling and convincing. Understand the synonyms which can be used in the content (see a later point on how to approach this). The more content you produce, they will become less accessible to visitors while on your site. But also, search bots will also start to struggle to find these deep pages. This can result in less link equity being distributed, causing potential drops in organic search traffic. By having effective pagination on your blog, it can help to improve the equity flow and accessibility to these older posts. However, there will inevitability be decreased value assigned to those posts. – Fresh insights and research to improve the credibility of the post. People love examples. And if there is more recent work that you have done to showcase how you have found a solution to a previous problem, then add it. Alternatively, if you are struggling to add new insights, review the optimisation of the posts. And where necessary, start applying more related keywords in the form of synonyms to help add more context and clarity for bots and people to recognise that this post discusses the topic relevantly. There is a name for this technique in the search world: latent semantic indexing. Without going into too much detail, at the core of SEO strategy is having good relevant content, which is readable to bots. Search engines base a large part of their algorithms on content, which is why having alt text tags on images is an important step in helping them to gauge page relevancy. And despite some glowing endorsements directed to Keyword Eye, personally, when I experienced it, from a tool quality and customer service perspective, it began a 6-month nightmare! Try it for yourself – maybe the tool and the staff had a vendetta against me …! You will need to setup a paid campaign to get the benefit of seeing specific search volumes. If you have been able to get it setup, the next step is to place a phrase into the tool, wait a moment, and select the ad groups tab. While here, it displays the range of related keyword groups associated with the core term which you added into the search box. This is where it gets useful because this technique enables you to tap into a part of what Google is thinking. In other words, gold dust territory for those seeking insight into the algorithm for getting better results. Add all the relevant groups to your plan, download and export it into excel. Now, during this export there will invariably be a few rogue phrases – don’t worry about excluding these from the mix. By following the next few steps, you will see why. 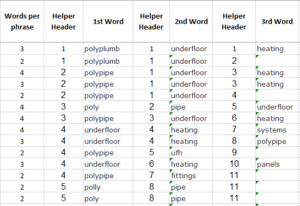 Within the excel document (email/tweet me to request it) by adding the phrases and search volume export into a tab, it will separate the phrases into individual words. Another formula removes duplicate words. Next, place these into the 1st tab and order the words from the highest to lowest search volume. Here is a preview of how this doc takes shape. Apply phrases into the column. Then the formula automatically separates phrases into individual words, like below. 2. Another formula assembles these words into one column. Take these and remove duplicates. By doing this, it will enable you to identify the list of related words which are associated with the core keyword topic. The relevant ones – particularly those with high search volumes – will act as potential words to incorporate into your content. Using the above example, SEOtools for excel, is an awesome toolset which pulls in data using a range of API’s from other sources (I would highly recommend installing it for a measly 90 quid per year). Anyway, for this scenario, the major benefit is that it allows you to understand how many instances of the word are present on the page. To apply this technique across a high number of topics will take time, particularly if you have hundreds or thousands of posts. So will be important to prioritise and know where to look – otherwise, instead of moving the needle faster, you will end up not being able to find the needle in an almighty haystack. Although this is aimed at updating old posts, similarly, while creating new posts, adopt this technique to ensure you are covering the right words. Those new posts may take longer to achieve stronger positions, but at least you don’t have to spend time back tracking and improving the optimisation at a later date. Once you feel that your post is renewed and comprehensive enough to contain fresh insights and a range of related synonyms, update the publication date and promote it by scheduling a range of posts. Even if you have a small social or email subscriber following, by getting into the habit of applying this, over time, it will help to amplify the chances for people to see your post, particularly when a certain type of message will resonate more strongly for them. Although this is not directly related to organic search, there is evidence to suggest that social shares do influence your sites’ authority. In any case, indirectly, if more people see the post, then there is a greater chance that they will link to it. Following 2 to 3 post updates per week since they started scaling the project, they have been able to increase organic search traffic by 106% per post, on average. 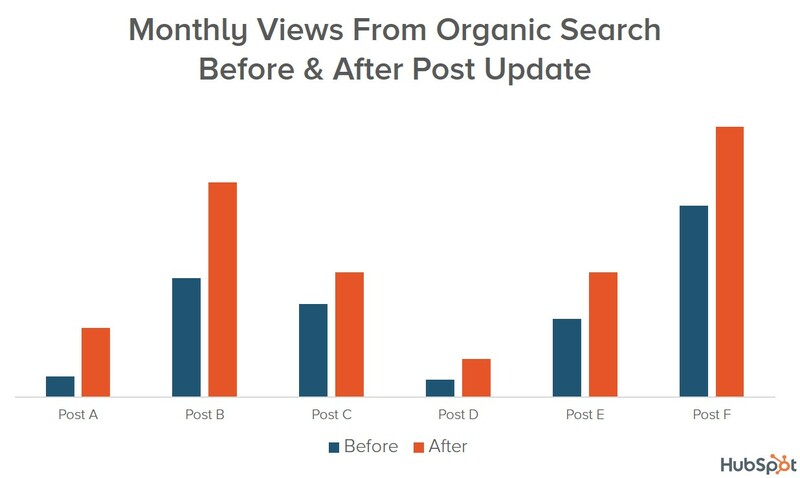 Although Hubspot has got the domain authority & brand presence to amplify this effect, it is clear that updating posts can provide short-term benefits. But don’t take our word as gospel, in the last section, I’ve given some tips for you to go away and discover which techniques work and last over time. You’re probably thinking that I have either gone mad, misspelt or someone else has sabotaged my blog. However, seriously, this is a technique that I’m prepared to share with you. Granted it is a risk, but it is something that has worked on two occasions for clients I have worked on. As you are involved or maybe you are interested in becoming a marketer, then you will soon or you are already familiar with the need to take risks. Albeit these will need to be calculated risks, but nevertheless, trying something that is against the grain, but can be perceived as logical once in a while, can bear fruit. On the two occasions that this was attempted, ranking movements across a range of keyword sets had moved. Whereas previously, there was minimal movement despite concerted efforts using alternative techniques such as targeted link building. Quick and easy procedure: no need to spend time going through and editing reams of posts. If you receive a lot of organic traffic and importantly revenue through your website – particularly if they are mainly via new visits who are unaware of entering your domain in via the browser (aka direct traffic) – for a period of at least a week to 2 weeks, you are likely to lose traffic and sales. Brand reputation may be impacted following growing speculation that there may be an issue with your brand. If you are a large international company listed on the stock market, this may negatively affect share prices. If you have an e-commerce store and a poorly functioning site search, loyal customers who are actively trying to seek and find your products can become frustrated and look elsewhere. I.E. visitors may search your brand followed by the product via a Google search. In any case, to reduce the risk, only apply this rule towards the blog. Normally, the blog contributes less immediate value due to the user seeking information rather than intending to purchase. Of course, it is important to undertake your checks before deciding. Error pages which have links or previously held traffic are common discoveries I have made while analysing sites. This is particularly true for those sites which have been around for a long time. As highlighted earlier, link building takes time. So with that in mind, for those links which are being directed towards your site, ensure that they are pointing towards active 200 pages; otherwise, you may be missing out on quite a lot of misdirected link equity. What do I need to do to rectify this? Then using screaming frog, crawl these list of pages and pick out any pages which have a 4xx 5xx status code (I.E. 404 and 500). Once selected, these then require 301 redirections to an appropriate new destination. Secondly, and I have found many instances where previously high traffic pages didn’t have any links towards them, but following an undesirable redirect pathway to a less related page, traffic was lost. This technique sounds simple, but from my experience, if this is not applied correctly, it can be a potential site killer, resulting in significant amounts of lost organic search traffic. If you have had a site migration or previously removed pages from your site, then it makes sense to do this quick review. In your Google Analytics account (or any other tracking software you use), go back to the beginning, since records began for your property. As we are only seeking to understand the valuable pages via organic search, only focus on those pages which received organic search traffic. Export the list of pages, then place the list of URL’s into screaming frog to establish their status code. For any URL’s which have a 4xx or 5xx status code (I.E. 404 or 500) and received decent amounts of traffic, despite not having any links directed towards them, map those to an equivalent matching page. Within the spider configuration settings, ensure that you select the ‘Always follow redirects’ option. Understanding the length of your redirect chains is an important step to avoid losing equity between each path. For example, if there are 3 redirect chains leading to the eventual page, this can result in lost equity.An announcement by Google suggested that all 3xx’s would pass PageRank. But as Cyrus Shepard pointed out in the post, PageRank isn’t the only ranking signal and that announcements like these have been made in the past which later showed to be different in the real world.However, it is still useful to stay on the side of caution, particularly when dealing with multiple redirect pathways because it can also have a negative effect on site speed. Testing. This is often a neglected part of the process because it takes time to assess. And due to the wide ranging and growing set of ranking factors search engines use as part of their algorithm, it is often difficult to establish whether it is a correlation or causation. This uncertainty can cause people to assert that time could be better spent doing the work. To an extent, this can true, especially if you can draw on a wealth of experience across a range of situations. But as things move at lighting speed in the SEO world, that once held experience can become redundant if you don’t remain current and detect the influence changes can make on performance. To speed up the process, by using a combination of tools; SEMrush, Majestic SEO and the Way Back Machine, you can create a range of testing scenarios without having to actually carry out an experiment. Way Back Machine is a great way to tap into the past and witness how a site looked. This is useful because by detecting when a site made a change – whether that is to their content, architecture or internal linking, for example, it is possible to measure the influence these changes had on their organic visibility by using SEMrush. SEMrush is incredibly powerful in this situation, because it also allows you to track historic performance. By connecting the date of the change to the date provided via SEMrush, it is possible to identify correlations. This method isn’t without its flaws. In particular, due to the range of ranking factors, which are part of the algorithm, other factors may be playing a crucial role. For example, links pointing from other websites are still shown to offer benefits. This means that during the time of the site’s onpage changes, links may have been built to help grow their visibility for that page. Fortunately, Majestic’s historic backlink checker allows you to isolate when that link was first detected at either a page or domain level. It can still be useful to investigate the number of links pointing towards a page which has increased its organic visibility. For example, if there are no links pointing to the page, this offers a stronger indication that onpage changes were influencing that rise. To help illustrate the strength of this approach, I have selected a site which is in a relatively competitive vertical. Interestingly, initially, this site was chosen to demonstrate the positive long-term effects subtle changes can have on your organic exposure. Prior to this decrease, it is important to note that this site experienced sustainable growth since January 2014. They occupied the top positions for the ‘sell your car’ & ‘buy your car’ market for at least three years. 90% of their link profile was dominated with link directories. They were using high volumes of keyword focussed anchor text within their internal links. On September 2014, the https://www.sellyourjamjar.co.uk/value-my-car/ page was only ranking for one keyword. Then, following anchor text changes to their internal links to reveal ‘sell my car’ in November 2014, the number of keywords ranking for the page improved to 20. By January 2015, that had risen to 39 keywords. The content or page template did not change until between the period May and September 2015. We cannot precisely isolate when these changes had been applied, but according to SEMrush data, it is clear that their presence had a further increase to 77 keywords ranking in the top 20 positions. From this, we can infer that the content was added in June or July 2015. 3. Using Majestic’s backlink history comparison tool, it is clear that there was one link built in October 2014 and May 2015. Links and adding content to influence rankings is certainly not a ground-breaking discovery. The significance of these findings is that the initial improvement in organic visibility occurred following the changes within the anchor text of the internal links. As the table presents, between November and December, there was a slight improvement in organic visibility. To help better understand the reason behind this drastic shift in performance, according to Search Engine Land, there was an unconfirmed Google Algorithm update, which indicated that the cause is due to spam linking activity. Folks in the “black hat” SEO community seem to be noticing this and complaining that their tactics are not working as well. If these suspicions are true, it becomes increasingly apparent that spammy linking activity has started to negatively affect their performance. Despite helping to influence performance for a number of years, spam link building tactics are not sustainable and will inevitability be penalised by search algorithms. Whether that link(s) had a direct impact on performance over a sustained period of time? Was it a link within the content. If yes, where? What was the anchor text and does the page’s distribution seem balanced? What is the link profile & presence of the site – is it similar to your site, or is it a much stronger site which can distort what you can realistically achieve? Using Majestic SEO data which isolated the number of unique linking root domains per page. By combining these two sources, I was able to evaluate the extent to which the number of links positively contributed towards the average visibility of the top 10 ranking positions. This was achieved by dividing the total number of pages which are within that ranking range against the cumulative top 10 monthly search volume for that page. 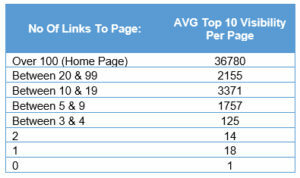 The table shows a strong correlation favouring more links towards a page. Whereas having zero links directed to a page offers a compelling insight. To put it simply, 170 pages had zero links towards them. Out of those 170 pages, there were three keywords ranking in the top 10. Each had 60 monthly searches, meaning the total cumulative searches was 180. By dividing the total number of pages (170) with the total monthly search volume (180), it presented – on average – one available monthly search per page for a top 10 result. Minimal presence, indeed! A caveat: quality links will always outweigh quantity. So do not feel an excessive number of links (over 10) per page is a requirement. In fact, excess inbound links to a page can result in diminishing returns, causing wasted time & effort. A key point is that links remain a central part of the algorithm, and in my opinion, they are likely to remain that way for the near future. 2. By including keyword rich anchor text within internal links, it does appear to affect ranking changes. But, and this should go without saying it, don’t needlessly stuff your content with repetitive exact match anchor text links. 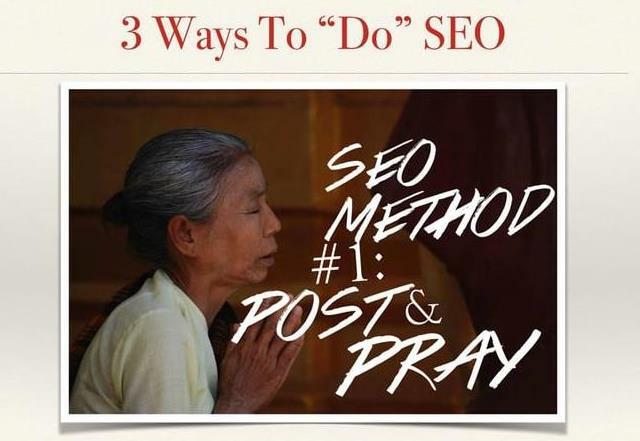 Instead, give the search engines a natural reference point which will help guide them to what the page is about. This is only one element of undertaking internal linking. Neil Patel presents a comprehensive overview of internal linking here. 3. The navigational change also improved performance. However, it would be interesting to have understood the sustained impact a mega menu would have had if the February penalty did not occur. 4. Unsurprisingly, considering search engine’s index content, following the content changes in June 2015, it was clear that further ranking improvements occurred. This means creating rich, semantically relevant content (as demonstrated earlier in the post), not only adds value but also, it has the capability of producing results within a short time-frame. Of course, this isn’t an exhaustive list by any means. But I hope this has given you a better idea on which techniques to employ, making that all important difference to growing your organic presence. Feel free to share your own ideas and if you attempt these tactics, I would love to hear your successes or failures. Click this link ‘View Summary’ button at the top of the post for a quick recap. Link’s still matter. It is undeniable that sites with stronger link profiles outrank their weaker companions. Therefore, for those sites who already have a strong profile, there is a greater chance that subtle changes can catapult you to greater success. Identify your existing search presence for your site, site categories and specific pages. SEMrush or SEOmonitor are two great examples for establishing this. By identifying pages, which are already ranking strongly, it can help you to prioritise your efforts, which can enable you to realise quicker benefits. Refreshing content: this can involve updating meta titles by harnessing the power of the RankBrain update, updating historic blog blogs which involves adding fresh insights or improving its optimisation; or lastly, deindex your site. This last tip may sound extreme, but I have had evidence of it working. If you have gone through site migrations and changing pages, ensure redirects are properly mapped to the correct location & if there are multiple redirect hops, consider reducing the length of the chain. As you know, search engine algorithms are in constant flux. The effect of these changes can change over time, so it will be worthwhile carrying out your own tests to gauge the impact certain tactics are having. Using a combination of ‘The Way Back Machine’, SEMrush & Majestic, it is possible to isolate what onpage or offpage changes occurred within a month to determine if it correlated with an impact in performance, which was also sustained over a longer period of time. Insights Strategist who specialises in SEO, Inbound marketing and dabbles in some CRO. Coffee hater, a follower of that red team in Manchester and a keen runner.